If you had an opportunity to travel, or just get away from school for the week, I hope that you have returned relaxed and ready for action. We had a very productive break week. My desk is free from papers, my inbox is empty, and the budget presentation is complete. This can mean only one thing...time for building and classroom visits! Sports: Spring sports are about three weeks away, but we still have hockey and indoor track representing us. (Congratulations to the Wildcat Hockey team who are Section III Champions!) Stay tuned for their competition schedules. Upcoming Conference: Also this week, I will be attending a conference about the Common Core Learning Standards, Response to Intervention, and Technology in Classrooms. This conference is always an important part of my decision making process because the attendees are selected to provide input. The top researchers and developers are invited to present, and I get a chance to see many products and strategies well before they hit the open market. Good stuff! Schooltool: If you haven't had a chance yet, please take an opportunity to explore our student management system, Schooltool. You can access the application from our website or by clicking here. The system is fully operational, and there are varying levels of information about your student(s) depending on the grade level. I am not normally the biggest fan of mid-winter break. With all of the different initiatives, policies, plans, and procedures that we have had to work on this year, I am happy to take the five days without staff and students so I can clean off my desk, finish the budget, and attend the several Sectional games that are happening this week (check our website for details). We have much to appreciate this year as Wildcats. When school resumes, there will only be four short months until graduation. If you are away or are able to enjoy this time with your family, be safe and enjoy your time away from school. 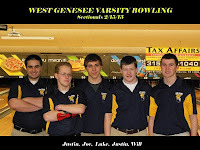 P.S.- I thought I would include this cool picture of some of our bowlers provided to me by Christina Sakran. Enjoy! This weekend I was reminded why my degrees in education mean nothing when it comes to plumbing. 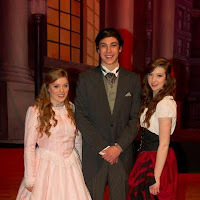 On Friday, I had four balcony tickets to go see Jekyll and Hyde at the high school. I was excited and ready for a relaxing night out. The day and subsequent evening were anything but relaxing as we were pounded by the snowstorm that was called "Nemo" for some reason that I will never figure out. 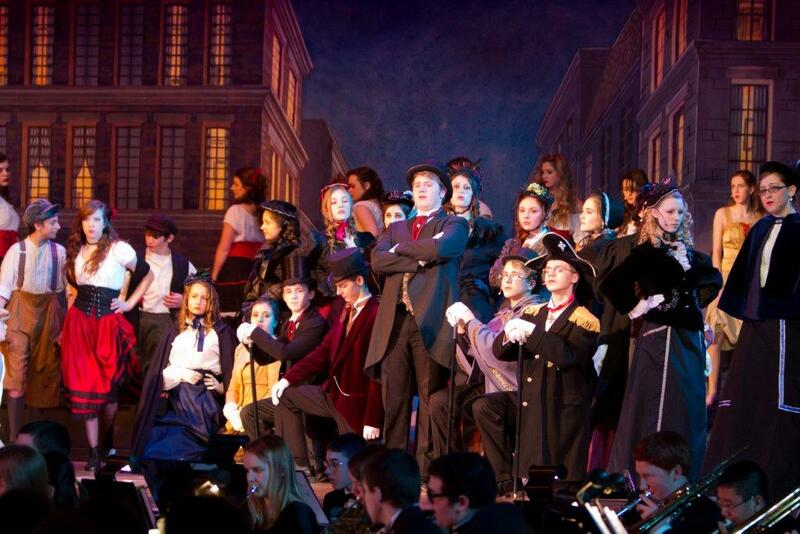 The performance had to be cancelled and two performances were scheduled for Saturday. Not a problem, I thought. I could go to the 2:00 p.m. show and all would be well. Then I heard and smelled something coming from the back corner of my basement. 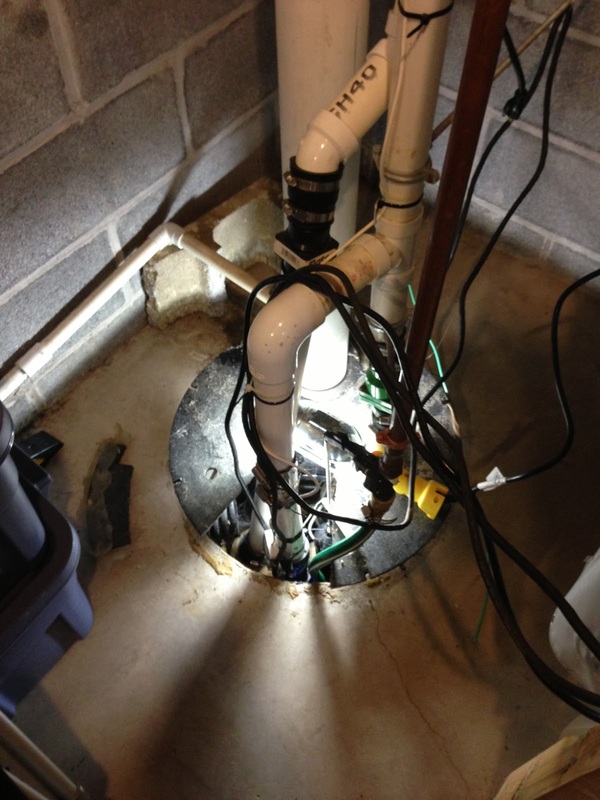 It was my sump pump, that thing that protects my "man cave" from peril. It wouldn't shut off which is not good when there isn't enough water in it to keep pumping. Rats. I rolled up my sleeves and took it apart (I included a picture so you can see what I was wrestling with) and tried to locate the problem. Not a good idea. After a couple of hours, some choice words, some WD-40 and duct tape (always have to use duct tape), it was working well enough for me to feel comfortable again until I could get a qualified plumber to the house! Bottom line: I missed the show... bummer. Then I received a text from a guy who knew a guy who recorded the performance. Sweet! I will be watching it later today, and I am very excited. I must have heard a thousand times how well our student performers did and again, I am very proud to be the superintendent where events of this quality happen. Good times! Winter sports are coming to a close and our student athletes have represented us very well. I have this feeling that at least one of our teams is going to make it to the top. Either way, as long as I see maximum effort, I will be pleased. 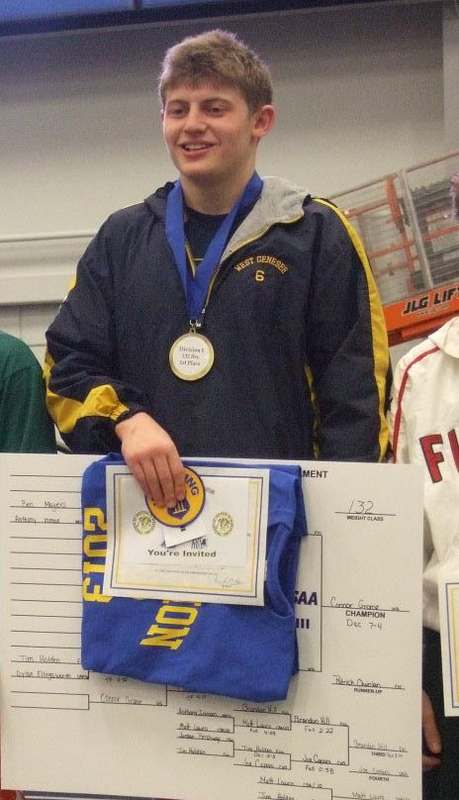 A couple of individuals who have stood out are: Connor Grome in wrestling (pictured at right) and Laura Leff in Indoor Track. Connor has the most number of wrestling wins in West Genesee history and Laura Leff is faster than the road runner and will be participating in the very prestigious Millstone Mile. Congratulations! 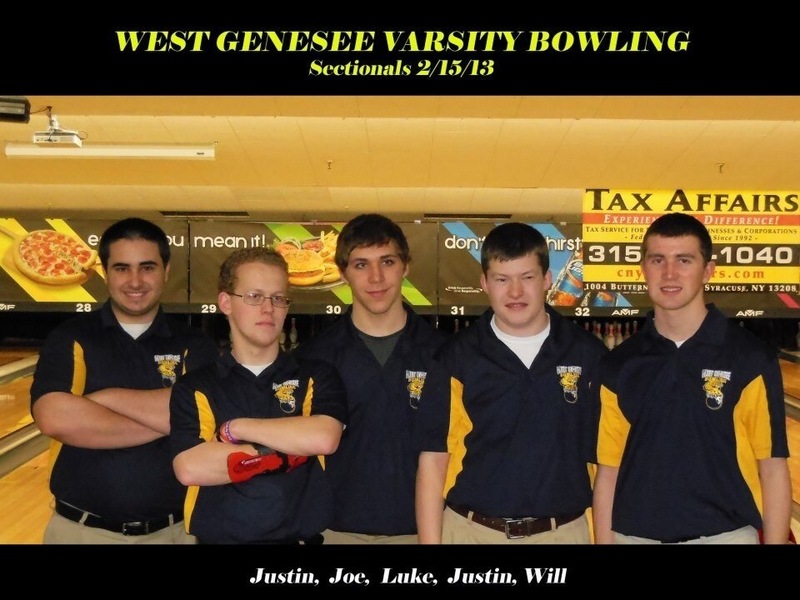 For a schedule of Sectional events, please head to our website at www.westgenesee.org. Strategic Planning: Last week we conducted our Strategic Planning session. I would like to thank the staff, students, community members, administrators, and the Board of Education for helping us to create our guiding document for the 2013-2014 school year. We are still working on the master document and will make it available when it is finalized. Some of the goals that were added to existing goals are related to providing more support for mathematics. This means exploring how to find students and staff more time in the school day/year to plan and work, and continue to work on ways to keep our schools as safe as possible. Have a wonderful week. Mine is going to be very, very busy but that is okay, I will be doing what I love. Snow: Well some lake effect snow finally dipped south enough to cause some problems in our District. Our District is approximately 90 square miles, stretching from the thruway to Seneca Turnpike from north to south, and from Solvay to Marcellus from east to west. Normally lake effect stays north of the thruway, and we do not have to contend with it. On Friday, the snow unfortunately decided to dip south of the thruway and blanket about 60 of our 90 square miles. I have to commend our Director of Transportation for being in the northernmost portion of the District at the right time on Friday morning (I live in the southernmost portion of the District). I looked outside and even reached out to plow drivers and employees in my "quadrant" and all reports were looking good. Mr. Williams informed me that there was heavy lake effect heading our way from the thruway at a fairly fast pace. We delayed and the snow came and sat in the District. We closed, and I was thankful that we did. The snow did not move out of the heart of our District until almost 11:00 a.m. and then came back to visit right around our normal dismissal time. I went home for the day around 5:00 p.m. and the sun was setting and the sky was clear. Crazy for sure; but that is lake effect. Weekend Events: As you might imagine, all of our Friday events had to be rescheduled for Saturday or beyond. This made for a busy Saturday around the District. If you passed the high school between the hours of 8:00 a.m. and 5:00 p.m., you saw that it was absolutely packed. 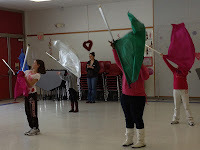 The cheerleaders had their annual "Sweetheart Classic" Tournament that drew nearly 50 schools. Our musical performers were conducting a "double-full" rehearsal of their musical, Jekyll and Hyde, that opens this Thursday evening. I have to applaud all of our custodians and grounds crews for having parking lots, sidewalks, and buildings cleared and ready for so many people. Thank you. Across the street at Stonehedge Elementary and down the road at Onondaga Road Elementary were Enrichment Days. I have included a picture of some elementary students practicing color guard moves at Stonehedge. It reminds me why I chuckle when people tell me that I am lucky that our Marching Band wins so many championships. I am not sure who said it long ago, but the more you practice the "luckier" you get. Spelling Bee: Also a HUGE congratulations to West Genesee Middle School eighth grader Brennan Costello who finished as runner-up in the Post Standard Central New York Spelling Bee. She lasted 19 rounds, which is amazing. The eventual winner, Maja Cannavo from Manlius Pebble Hill School will move on to Washington D.C. for the National Spelling Bee. Congratulations and who needs spellchecker or auto-correct anyway? Strategic Planning: This week is our Strategic Planning process. What comes out of our planning process will dictate the direction the District will head academically during the 2013-2014 school year. I am excited to work with students, community members, staff, and Board of Education members on such an important plan document. Budget Planning: We are also working to create our budget document for the 2013-2014 school year. It is coming together well, and I expect any resulting tax levy to be well under the tax cap calculated for West Genesee. I also expect that we will not need to make budget related cuts either. This will be the first time in three years that I am able to say this, and I am very appreciative of all of the support we have received from every area of our school community in order to be in this position today. Have a great week and I am hoping to see you at some of the many events that we have happening in and around the District.